ARCHANGELS is a company based in God's Country (beautiful sunny Southern California), dealing in Rare and Unique Paper Collectibles. We specialize in vintage Comic Books, Original Comic Book Artwork, Hollywood Movie Posters and other related items as well. We are Senior Advisors to the Overstreet Comic Book Price Guide and a Charter Member Dealer with the Comics Guaranty, LLC (CGC). For other wonderful items, make sure to visit us at our About Me Page. 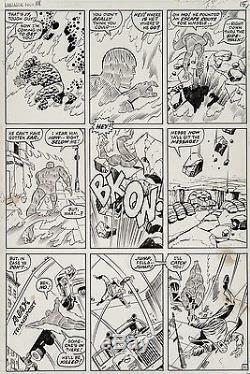 Fantastic Four #111 Art by John Buscema. Pulse pounding original artwork for Fantastic Four #111 page 11(Marvel Comics, 1971) by Hall of Famers "Big" John Buscema (pencils) and Joe Sinnott (inks) for the story, The Thing Runs AMOK! " This is a "no-holds-barred full battle page with the Human Torch going toe-to-toe with the Ever Lovin' Thing, trying to keep Ben at bay as he rampages through New York City and even flying to the rescue of a doomed truck driver to boot. This is ACTION in the Mighty Marvel Manner, just as you love it by one of the greatest art teams in the history of comicdom. Art is in excellent condition with image size 10 x 15. The item "Fantastic Four #111 Art by John Buscema Joe Sinnott Thing vs Human Torch battle" is in sale since Tuesday, April 14, 2015. This item is in the category "Collectibles\Comics\Original Comic Art\Interior Pages". The seller is "water-walker" and is located in San Diego, California. This item can be shipped worldwide.